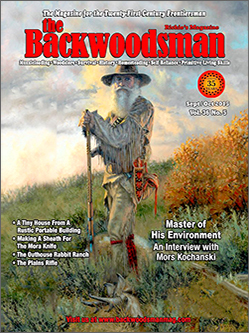 I'm thrilled to say that the interview I conducted with Master Bushman Mors Kochanski is now available in the latest issue of Backwoodsman Magazine found at bookstores and online. In it, Mors discusses his childhood growing up in Canada using traditional bushcraft skills, his love of books and research, and tips for aspiring woodsman. Few people in the world have his scholarly background and years of practical experience living the life in the wilds and it was a real honor to speak with him. His book, Bushcraft is the tome that every wilderness skills practitioner should own and put to use.